Do you like classic cars and specialty cars, this is the place to be. 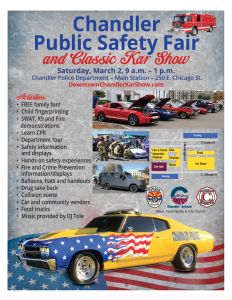 Police and Fire will be giving demonstrations and there will be food trucks and much more. Come by to see Stoppy the Red Light! March is Red Light Running Awareness Month and the Proclamation from the Governor will be read during the car show.